This entry was posted on Friday, February 1st, 2019 at 7:31 pm. When 11 year old Velveteen “Velvet” Vargas joins the Fresh Air Fund, all she expects is a few weeks away from her Brooklyn home in the upstate New York countryside. What she doesn’t expect is the beginning of a new life and a new passion. 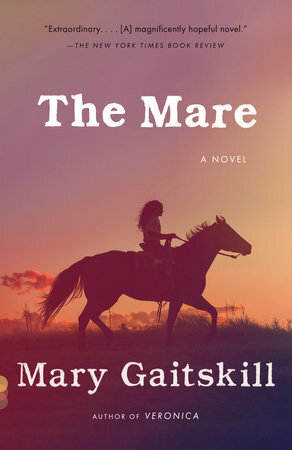 Mary Gaitskill’s The Mare explores the lives of young Velvet, her Fresh Air Fund hostess “mom,” Ginger, and an abused mare called Fugly Girl. Ginger is past child-bearing years when she and husband, Paul, marry, but they have always toyed with the idea of adoption. Before they fully commit, however, they decide to do a trial run and become a host family for a Fresh Air Fund kid. As soon as Velvet enters her life, however, Ginger decides against adoption to instead become a permanent fixture in the child’s life. Instead of just two weeks per summer, Ginger and Velvet work out an arrangement where the girl can visit almost every weekend. Ginger’s home is right next door to a farm, and Velvet immediately falls in love with their horses. Soon she finds herself mucking stalls and grooming horses in exchange for riding lessons. She’s also drawn to the new horse, a feisty mare with a broken past. Velvet, also from a broken home with an abusive mother, instantly bonds with the mare. With her odd conformation and angry personality, the boarders at the barn call the mare Fugly Girl, but Velvet sees through the hurt and pain and admires the horse’s spirit. She quickly renames her Fiery Girl. The instant bond between Velvet and Fiery Girl is unmistakable, and as Velvet’s riding improves, she begins working solely with her mare. As the novel progresses, Velvet becomes increasingly torn between her life with Ginger and Fiery Girl, and her familial obligations to her younger brother and very difficult mother, Silvia. But through the stress and torment she faces from her mother and her peers, she keeps coming back to Fiery Girl, again and again. Through Velvet, Gaitskill expertly connects these two vastly different worlds: the often-dangerous inner city and the quiet, slower life of the countryside. But, as Velvet quickly learns, everyone is fighting his/her own battle, regardless of where they live, and she soon realizes that her only true home is with her horse.